If you want to see covered bridges during your visit to New England, you can't beat Vermont's Bennington County for its dense concentration of these photogenic and historic landmarks. Bennington County is located in the southwest corner of Vermont, and visitors to the area can drive and see five covered bridges within several hours (allowing time to take photographs, of course). You can choose from a range of accommodations in Bennington if you'd like to stay the night. To find your first covered bridge, start in Bennington, Vermont, and follow Route 7 North to a left on Northside Drive, which becomes Route 67A West. Watch for a left turn onto Silk Road. The 88-foot-long Silk Bridge, a Town lattice truss bridge, was built circa 1840 to span the Walloomsac River. The builder is believed to be Benjamin Sears who was from a local family of bridge engineers. This striking red bridge was added to the National Register of Historic Places in 1973. Silk Bridge is open to vehicular traffic, but if you drive through, take your photos and then turn around, as you're headed back to Route 67A to continue your covered bridge tour. As covered bridges go, Paper Mill Village Bridge is fairly new. The bridge you'll see on your tour was built in 2000 to replace the original 1889 covered bridge built on this site by Charles F. Sears. The bridge is next to a former paper mill building, thus the name. To reach this next covered bridge, return to Route 67A West, then, just about .2 miles down the road, turn left onto Murphy Road. Like all of the bridges you'll see on this Vermont covered bridge tour, Paper Mill Village Bridge is an example of Town lattice truss design. The town lattice truss system features timber diagonals with no verticals. If you drive straight through the previous covered bridge, Paper Mill Village Bridge, and continue on Murphy Road, you'll find the next covered bridge, Henry Bridge, 1.3 miles down the road at the intersection of Murphy Road and River Road. Henry Bridge was built originally in 1840, but the bridge you'll see is a replica constructed in 1989. The covered bridge is named for landowner Elnathan Henry, an Irish immigrant, whose nearby 1769 home is now The Henry House Inn. This is the third red bridge, so you may be wondering about the color. Most covered bridges were painted red simply because iron ochre was an inexpensive paint pigment. After driving through Henry Bridge, turn right on River Road, which reconnects with Route 67A. Turn left and follow Route 67A to Route 67 East. Turn left on Route 7A, then right on East Arlington Road in the town of Arlington. Here, you'll discover yet another red covered bridge. The 117-foot 1870 Chiselville Bridge was built across the Roaring Branch Brook at a cost of $2,307.31. Located high above the water, Chiselville Bridge, once known as High Bridge, survived the flood of 1927. Many other Vermont covered bridges were not as fortunate. The most intriguing thing about the Chiselville Bridge is the sign, which warns motorists that there is a one dollar fine for driving across the bridge at a speed faster than a walk. Besides saving a dollar, there's another good reason to drive slowly if you're touring Vermont's covered bridges with someone you love. Covered bridges were once known as "kissing bridges" because they provided a moment of privacy during the days of horse-and-buggy courtships. To reach the final covered bridge on your tour, return to Route 7A and continue north to a left on Route 313 West. You'll find the West Arlington Bridge about 4.5 miles down the road. The 80-foot long West Arlington Bridge is one of Vermont's most photographed and painted covered bridges. It is also is one of the state's oldest original covered bridges. 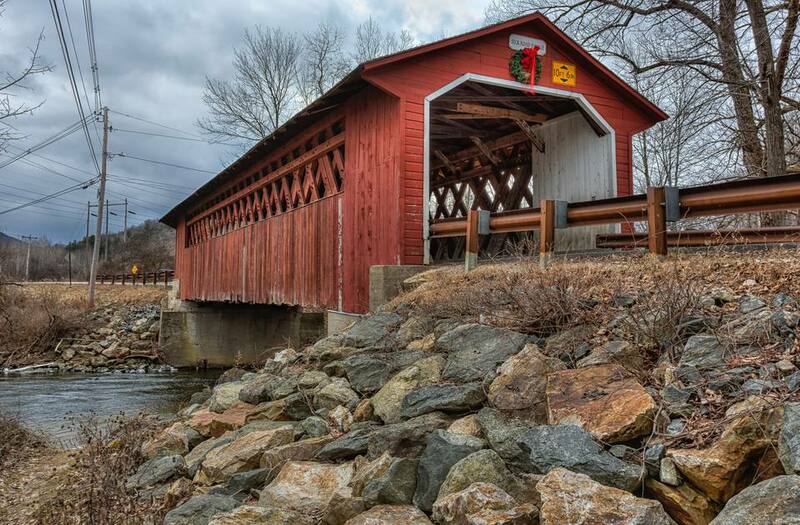 Dating to 1852, the picturesque red bridge is located on the town green near the former home of painter Norman Rockwell, which is now the Norman Rockwell Studio and Inn: an ideal landing place for the night. West Arlington Bridge spans the Battenkill River, a popular spot for kayaking and fly fishing. From Bennington, Vermont, follow Route 7 North to a left on Northside Drive, which becomes Route 67A West. Watch for a left turn onto Silk Road, where you'll discover Silk Bridge. Return to Route 67A West, then, just about .2 miles down the road, turn left onto Murphy Road. Drive through Paper Mill Village Bridge and Henry Bridge on Murphy Road, then make an immediate right onto River Road, which returns you to Route 67A. Turn left and follow Route 67A to Route 67 East. Turn left on Route 7A, then right on East Arlington Road in the town of Arlington. Here, you'll find the Chiselville Bridge. To reach the final covered bridge on your tour, return to Route 7A and continue north to where you can take a left on Route 313 West. You'll find the West Arlington Bridge about 4.5 miles down the road. Visiting in the fall? Consider some of these other Vermont leaf-peeping drives.